Weeksella virosa Holmes et al. 1987 is the sole member and type species of the genus Weeksella which belongs to the family Flavobacteriaceae of the phylum Bacteroidetes. Twenty-nine isolates, collected from clinical specimens provided the basis for the taxon description. While the species seems to be a saprophyte of the mucous membranes of healthy man and warm-blooded animals a causal relationship with disease has been reported in a few instances. Except for the ability to produce indole and to hydrolyze Tween and proteins such as casein and gelatin, this aerobic, non-motile, non-pigmented bacterial species is metabolically inert in most traditional biochemical tests. The 2,272,954 bp long genome with its 2,105 protein-coding and 76 RNA genes consists of one circular chromosome and is a part of the Genomic Encyclopedia of Bacteria and Archaea project. Strain 9751T (= DSM 16922 = NCTC 11634 = JCM 21250) is the type strain of Weeksella virosa, which is the sole member and type species of the genus Weeksella [1,2]. The generic name was given in honor of O.B. Weeks for his contributions to the taxonomy of the genus Flavobacterium. The species epithet is derived from the Latin word ‘virosa’ meaning ‘slimy’, referring to the colony appearance of the species . W. virosa strain 9751T was isolated from a clinical specimen of urine and described by Holmes and coworkers in 1986 . These authors collected 29 strains from clinical samples, mostly obtained in the USA but also in other nations and continents, as the basis for their species description. Most isolates came from genitourinary tract samples, predominantly from women. Since then, strains of W. virosa were detected by cultural methods in the oral cavity , the genitourinary tract [4,5] of man, in clinical specimens of pigs , the urine of a cow with bladder carcinoma , and in the midgut of a Brazilian dipteran . Weeksella-like strains were also found in food samples  and environmental samples, however, the latter matched the genus description but could not be assigned to the species virosa thus suggesting that they are representatives of additional species within the genus that are not yet described [10,11]. About 2% of healthy women carry W. virosa on their vaginal mucosa . Two cases of peritonitis have been described as being caused by W. virosa [12,13]. Here we present a summary classification and a set of features for W. virosa 9751T, together with the description of the complete genomic sequencing and annotation. A representative genomic 16S rRNA sequence of strain 9751T was compared using NCBI BLAST under default settings (e.g., considering only the high-scoring segment pairs (HSPs) from the best 250 hits) with the most recent release of the Greengenes database  and the relative frequencies, weighted by BLAST scores, of taxa and keywords (reduced to their stem ) were determined. 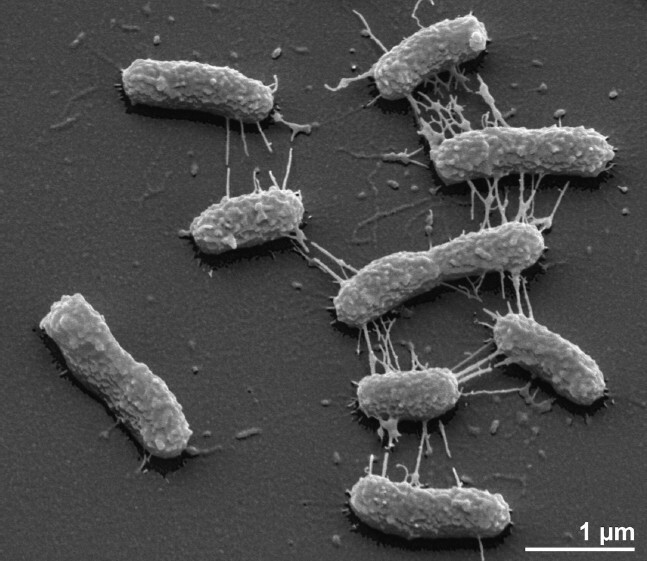 The five most frequent genera were Chryseobacterium (45.9%), Wautersiella (23.2%), Myroides (7.9%), Elizabethkingia (7.3%) and Empedobacter (7.0%) (134 hits in total). Regarding the single hit to sequences from members of the species, the average identity within HSPs was 99.2%, whereas the average coverage by HSPs was 96.8%. Among all other species, the one yielding the highest score was Empedobacter brevis, which corresponded to an identity of 92.0% and an HSP coverage of 97.0%. Accordingly, E. brevis groups as the sister genus in trees constructed from 16S rRNA gene sequences [16–19] whereas Bergeyella zoohelcum (family Flavobacteriaceae) is looked at as the phenotypic sister taxon which may be confused with W. virosa when applying traditional morphological and physiological tests . The highest-scoring environmental sequence was GQ383925 (‘sewage water isolate XJ109 Flavobacteriaceae str. XJ109’), which showed an identity of 92.5% and a HSP coverage of 98.5%. The five most frequent keywords within the labels of environmental samples which yielded hits were ‘skin’ (11.2%), ‘human’ (3.7%), ‘fossa’ (3.4%), ‘microbiom, tempor, topograph’ (2.8%) and ‘forearm’ (2.1%) (116 hits in total). The two most frequent keywords within the labels of environmental samples which yielded hits of a higher score than the highest scoring species were ‘sewag, water’ (10.1%) and ‘aerosol, air, citi, level, microarra, texa, two, urban’ (10.0%) (2 hits in total). From these sequence-based observations and the published culture-dependent detections (see above) it can be concluded that W. virosa occurs mainly as an inhabitant of mucosa of animals and man. Figure 1 shows the phylogenetic neighborhood of strain 9751T in a 16S rRNA based tree. The sequences of the five 16S rRNA gene copies in the genome differ from each other by up to three nucleotides, and differ by up to two nucleotides from the previously published 16S rRNA sequence (M93152), which contains eleven ambiguous base calls, and differ by up to 314 nucleotides from another previously published 16S rRNA sequence (AF133539) which obviously represents a strain of the genus Bacteroides. Phylogenetic tree highlighting the position of W. virosa relative to a selection of closely related other type strains within the family Flavobacteriaceae. The tree was inferred from 1,339 aligned characters [20,21] of the 16S rRNA gene sequence under the maximum likelihood criterion  and rooted in accordance with the type strain of the family. The branches are scaled in terms of the expected number of substitutions per site. Numbers above branches are support values from 700 bootstrap replicates  if larger than 60%. Lineages with type strain genome sequencing projects registered in GOLD  are shown in blue, published genomes in bold. 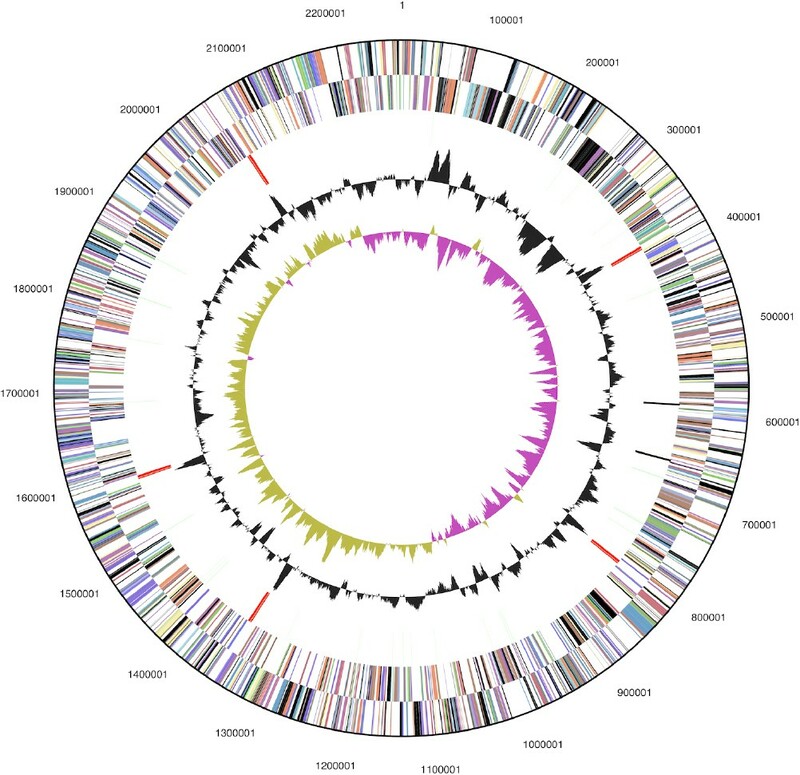 The genome of Riemerella anatipestifer is described in this issue of SIGS . The cells of W. virosa are rod-shaped (0.6 × 2.0–3.0 µm) with parallel sides and rounded ends (Figure 2). According to Holmes , the cells stain Gram-negative, are nonmotile and non spore-forming (Table 1). No intracellular inclusions such as polyhydroxybutyrate were detected. Colonies on nutrient agar appear circular and low convex with entire edges, smooth, shining and mucoid, reaching 2mm in diameter after 24h . While the colonies are described as being non-pigmented on nutrient agar by most authors [1,37], the production of a nondiffusible yellow pigment was reported during growth on blood agar . Most strains produce a diffusible dark brown pigment on tyrosine-containing agar . The strains grow at 42°C but not at 5°C . W. virosa is a strictly aerobic chemoorganotroph and is not able to reduce nitrate, nitrite or selenite and does not acidify glucose or other sugars under standard conditions [1,5]. However, under test conditions developed for fastidious organisms such as Neisseria (API NH strips, Biomérieux), acid is produced from glucose [IDA] as is observed for the phylogenetic neighbors E. brevis and Wautersiella falsenii [16,17]. Cytochrome oxidase, catalase and phosphatase are present . Tolerance to NaCl and pH ranges have not been reported. W. virosa grows on McConkey agar, indicating tolerance to bile salts . On the other hand, KCN (75 mg l-1), cetrimide, colistin , and polymyxin  are not tolerated and inhibit growth. The species is able to utilize β-hydroxybutyrate as a substrate and to hydrolyze casein, gelatin and Tween 20 [1,17]. Tryptophan is cleaved to give indole, pyruvate and ammonia when tested with Ehrlich’s reagent, but the reaction can not be detected when Kovacs’ reagent is used . W. virosa is inert in most traditional biochemical tests , it does not utilize glucose as a substrate under standard conditions . W. virosa does not hydrolyze starch, esculin or DNA, and is negative for gluconate oxidation, urease, phenylalanine deaminase, arginine deaminase, arginine dihydrolase, lysine or ornithine decarboxylase, β-D-galactosidase , alkalization of galacturonate . The following enzymes are present as concluded from tests using API ZYM galleries: acid and alkaline phosphatase, lysine arylamidase, aspartate arylamidase, alanine arylamidase and methionine arylamidase . In addition, the following substrates were hydrolyzed in the latter galleries by W. virosa: naphthol-AS-BI-phosphodiamide, bis-(para-nitrophenyl)-phosphate, glycyl-glycyl-β-naphthylamide hydrobromide, glycyl-L-phenylalanyl-β-naphthylamide, glycyl-L-prolyl-β-naphthylamide, L-leucyl-glycyl-β-naphthylamide, α-L-glutamyl-β-naphthylamide, and N-carbobenzoxy-glycyl-glycyl-L-arginine-β-naphthylamide . W. virosa is susceptible to most β-lactams, tetracycline, chloramphenicol, nalidixic acid, erythromycin and sulfamethoxazole-trimethoprim . In contrast, the species is resistant to aminoglycosides . Classification and general features of W. virosa 9751T according to the MIGS recommendations . The major respiratory quinone of W. virosa is menaquinone 6 and the major polyamine is homospermidine, as is the case for all members of the family Flavobacteriaceae [11, 38–40]. No sphingophospholipids were detected . The polar lipids of W. virosa have not yet been described. The major whole-cell fatty acids of W. virosa are iso-C15:0 (46%), iso-C15:02-OH (10%), iso-C17:1ω12t (8%) and iso-C17:03-OH (7%) as described for CDC group IIf, the preliminary name given to these strains prior to being formally named W. virosa . A comparison of the patterns of W. virosa and ‘W. zoohelcum’ obtained at that time  with more recently published patterns of B. zoohelcum and E. brevis and phylogenetic neighbors [17–19] seems to cast doubts on the comparability of these early patterns. They are the only ones listing the presence of high amounts of iso-C15:02-OH and iso-C17:1ω12t, which are not listed for phylogenetically related genera later on . However, iso-C15:02-OH and isomers of iso-heptadecene are included in the summed features of the Microbial Identification System applied in many recent analyses including [17–19]. W. virosa 9751T, DSM 16922, was grown on DSMZ medium 220 (Caso Agar)  at 30°C. DNA was isolated from 0.5–1 g of cell paste using MasterPure Gram-positive DNA purification kit (Epicentre MGP04100) following the standard protocol as recommended by the manufacturer, with modification st/DL for cell lysis as described in Wu et al. . DNA is available through the DNA Bank Network [44–45]. The genome was sequenced using a combination of Illumina and 454 sequencing platforms. All general aspects of library construction and sequencing can be found at the JGI website . Pyrosequencing reads were assembled using the Newbler assembler version 2.5-internal-10Apr08-1-threads (Roche). The initial Newbler assembly consisting of 27 contigs in one scaffold was converted into a phrap assembly by making fake reads from the consensus, to collect the read pairs in the 454 paired end library. Illumina GAii sequencing data (4,788 Mb) was assembled with Velvet  and the consensus sequences were shredded into 1.5 kb overlapped fake reads and assembled together with the 454 data. The 454 draft assembly was based on 131.6 Mb 454 draft data and all of the 454 paired end data. Newbler parameters are -consed -a 50 -l 350 -g -m -ml 20. The Phred/Phrap/Consed software package  was used for sequence assembly and quality assessment in the subsequent finishing process. After the shotgun stage, reads were assembled with parallel phrap (High Performance Software, LLC). Possible mis-assemblies were corrected with gapResolution, Dupfinisher , or sequencing cloned bridging PCR fragments with subcloning or transposon bombing (Epicentre Biotechnologies, Madison, WI). Gaps between contigs were closed by editing in Consed, by PCR and by Bubble PCR primer walks (J.-F.Chang, unpublished). A total of 60 additional reactions were necessary to close gaps and to raise the quality of the finished sequence. Illumina reads were also used to correct potential base errors and increase consensus quality using a software Polisher developed at JGI . The error rate of the completed genome sequence is less than one in 100,000. Together, the combination of the Illumina and 454 sequencing platforms provided 2,171.8 × coverage of the genome. The final assembly contained 384,925 pyrosequence and 63,008,730 Illumina reads. The genome consists of a 2,272,954 bp long chromosome with a GC content of 35.9% (Table 3 and Figure 3). Of the 2,181 genes predicted, 2,105 were protein-coding genes, and 76 RNAs; 56 pseudogenes were also identified. The majority of the protein-coding genes (65.5%) were assigned with a putative function while the remaining ones were annotated as hypothetical proteins. The distribution of genes into COGs functional categories is presented in Table 4. This work was performed under the auspices of the US Department of Energy Office of Science, Biological and Environmental Research Program, and by the University of California, Lawrence Berkeley National Laboratory under contract No. DE-AC02-05CH11231, Lawrence Livermore National Laboratory under Contract No. DE-AC52-07NA27344, and Los Alamos National Laboratory under contract No. DE-AC02-06NA25396, UT-Battelle and Oak Ridge National Laboratory under contract DE-AC05-00OR22725, as well as German Research Foundation (DFG) INST 599/1-2.